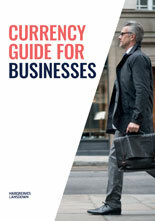 This essential report offers expert tips for small and medium-sized businesses looking to save money on their international payments. This guide is not personalised advice. One in three SMEs now trade internationally. So whether you’re buying goods from Germany or selling services in Spain, understanding your options when making international payments is important. Discover simple ways to save time and money on overseas payments for your business with our guide. Whilst this guide is packed with useful information, it does not provide personal advice. The Hargreaves Lansdown Currency Service is a trading name of Hargreaves Lansdown Asset Management Limited, which is a wholly owned subsidiary of Hargreaves Lansdown Plc, One College Square South, Anchor Road, Bristol, BS1 5HL. Company Registered in England & Wales No. 1896481. It is authorised by the Financial Conduct Authority (FCA) as a Payment Institution under the Payment Services Regulations 2017. The Firm Reference number is 115248. You can look this up on the FCA register website. The marketing of the service is not regulated by the FCA.